What would we do without Nichol Magourick and all her amazing talent and inspiration on making layouts and working on preserving our families memories. Ethan absolutely loves and looks up to his cousins (my brothers boys) and I love seeing them together. They always have a great time. I printed the journaling on a piece of Basic Grey pattern paper and added the "celebrate being a kid" using an Ali Edwards stamp set on the side. 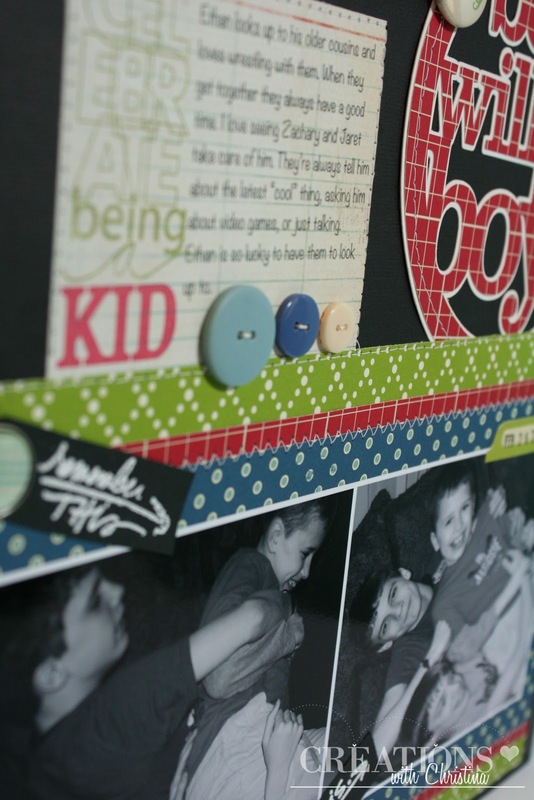 The buttons helped fill in that little space at the end of the journaling. I can't get enough of Ali Edwards stamps. 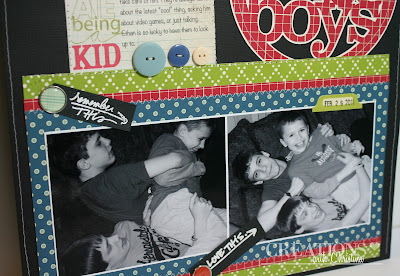 "Remember this" and "Love this" made great little tags to add to the pictures. My title is a download from the Silhouette America Store. Thanks everyone for stopping by. Hope you have a great day. Your new blog design is really gorgeous. I love the colors. Your layout is amazing too as usual. The blog redo is really nice. So easy on the eye...great idea! I really love the scrapbook layout, cute boys! love the new look. Beautiful colours. Nice LO too! Love the new look!!!! and the layout rocks! LOVE your new blog look! Fun, yet sophisticated! LOVE that boy LO, too!! The more I see what you've done with your Silhouette, the more I want one! Love the new look with the muted colors. So pretty. Great layout. Love the layout! I did scrap lift your last layout and it turned out so great. I agree with you about Nichol. I also love the new look. Thanks for sharing all that you do :). Thanks, this is so cute. I am so inspired. Love all the ideas you come up with. What a great layout! I like the new look too. Love the layout...very nice and love that Silhouette cut! I love the layout of the boys and I absolutey love your new blog redo! Great looking new site. I love seeing boy layouts. Having 2 small grandson's I run out of ideas. Love the layout!! New blog look is fantastic!! I just LOVE your new blog design. Really classy and fun. Love, love your L/O, the design and the embelishments. I too, am a Nichol Magourik and Ali Edwards fan. Love both their styles. Cute layout!! Your new blog colors are great! Love you new blog design. :) Great layout! what an awesome layout.. i would love to get a new look... but have a feeling they are a little pricey to have someone make it for you... AND what a SUPER layout. Great new look. Love the layout. I love the new Blog design. It is so true of what I have learned from following your blog, you craft with lots of heart. 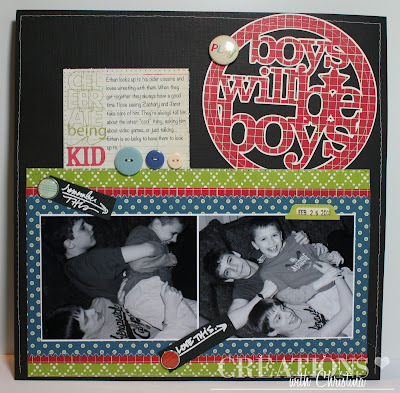 I love the layout also, with 8grandsons I am always looking for good designs for boy stuff. Girls are easy,they love dress--up and princess themes. I Love your ideas Christina. You have a wonderful family. Love this layout. 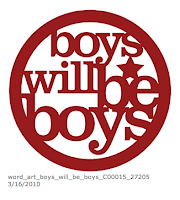 So fitting for your boy(s). I am going through my photos now a pic of my grandsons and their cousin. You got my creative wheels turning. Great pictures! And your layout shows them so nicely! 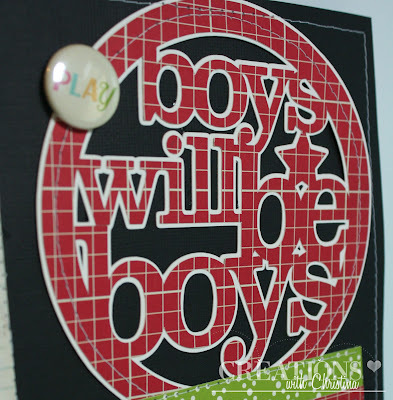 I love the title and how you added the stamping. Your new blog design is great, I love it! what a great layout and pictures!!! Love your blog redo too. I remember your last redo I thought it was great. This one is great too! !